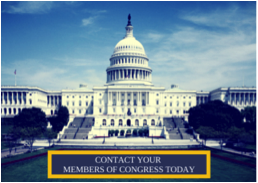 On March 19th we will host a Congressional briefing on Usher syndrome. Edwin Stone, MD, PhD, from the Stephen A. Wynn Institute for Vision Research at the University of Iowa will be the featured speaker. Ed will be talking about the exciting state of Usher syndrome research and the need to make this a higher priority at the National Institutes of Health to push us over the finish line. And we are in an exciting place. There are all sorts of treatments in development that hold tremendous promise. Gene therapy trials are under way. Stem cell and drug therapies are not far behind. There is already an FDA approved prosthesis for vision (the Argus II) and a whole slew of improvements on that technology in the pipeline. Optogenetics has applications for vision and many other diseases and ailments. It really is an incredible time. The only thing missing is an adequate amount of federal spending on Usher syndrome research. We’ve been working in Washington, DC these past few years and have found a lot of support in Congress. This is a great chance to finally get that funding we need. Here’s where you folks in the States come in. We need you, today, to contact both Senators in your state as well as the US representative for your district. Every representative in Congress has a website. On that website they all have a form where you can put in your name, email address, and a message to the Senator or Congressperson. This is the best way to contact them. They read these messages. They really do. I contacted my Senators and representative about the briefing. They each had a staffer email me back and commit to attending the briefing. That was just for the state of Massachusetts, though. We need all members of Congress to attend this briefing. To do that, we need you. The Usher Syndrome Coalition is hosting a luncheon briefing on Usher syndrome at 1:00 PM on Thursday, March 19th, in House Rayburn 2103, and I invite you and members of your staff to attend. I urge your support of report language encouraging NIH to make Usher syndrome funding a higher priority. Research in stem cells, gene therapies, and drug therapies hold tremendous hope for people with Usher syndrome. Yet Usher syndrome has received only a fraction of the federal funding allocated to similarly rare and devastating diseases. Groundbreaking new research on Usher syndrome is being done at the [SEE THE NEXT SECTION FOR WHAT TO PUT HERE] so increased federal funding for Usher syndrome research would have an impact right here in [STATE]. We hope we can count on your support and look forward to seeing you at the congressional briefing on March 19th. Okay, everyone got that so far? It is important that you make a connection between Usher syndrome and your state. Here are some states and places that are tied to Usher syndrome research. I’m sure I forgot a few so if you can think of one for your state, put it in the comment section of this post. If you don’t have a specific research connection in your state, don’t worry. You personally are more important than any research connection. Just mention that you are a member of the Usher Syndrome Coalition and that the funding will help you and other Usher syndrome families in the state. One last thing, which is a bit of a bummer. You can’t attend the briefing yourself. We would love to have you come, but the room is not large enough and as much as you all are an inspiration, we can’t risk crowding out the members of Congress. It says a lot about this Usher syndrome community that I have to write this paragraph. I know you would show up in droves otherwise. Don’t worry. We’ll need you in Washington at some point. For now, just get your congressional representatives to show up to this briefing. And for final inspiration I’ll remind you of this: I was told by a longtime Washington lobbyist that we are the best grassroots organization he has ever seen. You guys are an inspiration. Everyone got that? Great! Now email this link or share the Facebook post with everyone you know and ask them to contact their members of Congress as well. Then hop off this post and hop on the sites of your representatives.